Hugo Chavez arrived in Tehran on Saturday, calling Iranian leader Mahmoud Ahmadinejad his “ideological brother”- BBC. 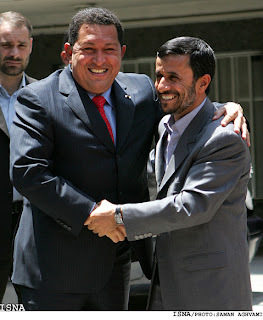 Chavez welcomed Mahmoud Ahmadinejad and Iran into the ALBA Movement with Venezuela, Cuba, Nicaragua and Bolivia today during his stop in Tehran today. It was a joyous reunion in Tehran today as Mahmoud and Hugo extended the cooperation between the two anti-Imperialist regimes. Iranian President Mahmoud Ahmadinejad in a meeting with his Venezuelan counterpart Hugo Chavez here on Sunday said imperialism is facing a strong wave of opposition in a majority of the world regions, and added that victory is close due to the shaky pillars of the world arrogance. Also during the meeting, Ahmadinejad pointed to Iran’s policy for developing relations with independent countries, and stressed that Tehran and Caracas seek to bolster cooperation in the different sectors in a bid to lay the required grounds for the development of Iran’s relations with the independent states in Latin America. He also viewed expansion of ties and boosting of cooperation among the world free and independent nations as necessary, and underlined that independent countries can pave the way for the progress and welfare of their nations through assisting each other. The president further referred to the ample potentials existing in Latin America, and cited establishment of joint trade companies, arrangement of fairs to display manufactured goods and products and reinvigoration of a joint investment fund as among possible ways for the Latino states to develop ties with other countries, specially Iran. For his part, Venezuelan president briefed Ahmadinejad about the latest conditions in Latin American, and stressed that cooperation among independent countries, including Iran and Venezuela, plays an effective role in defeating imperialistic policies and rescuing nations. Also noting cooperation among independent Latino states, he said countries of his region can lay the ground for the progress of their nations through utilizing Iran’s valuable experiences in the different areas. Elsewhere, Hugo Chavez welcomed Iran’s presence in the ALBA movement as an observer member, and assured that the Iranian nation will certainly embrace success through resistance against imperialism. 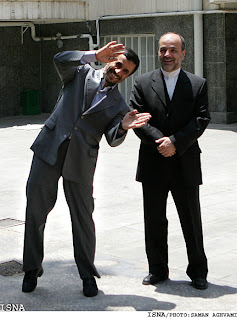 Mahmoud was gleefully awaiting his bud Hugo in Tehran. Meanwhile… Iran announced that even tighter gas controls were on the way. Earlier in the week, protesters smashed and torched gas stations in response to the regime’s rationing policies.